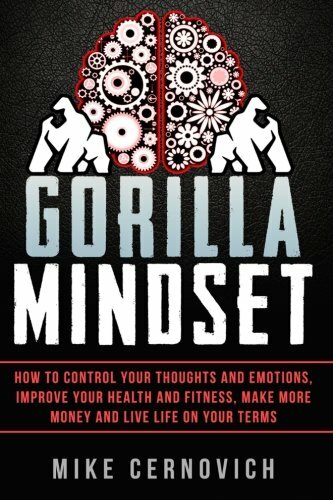 Gorilla Mindset is about controlling your thoughts and emotions to live life on your terms. Mindset is a broad term used to describe our attitudes to how we approach any kind of situation and topic. Gorilla Mindset is a book based on taking action with your thoughts and emotions to live life on your own terms. Our mindset can define how we approach and react to any kind of situation both good and bad. A positive mindset can help someone excel in life whereas a toxic mindset can lead to a spiralling journey of self-destruction and misery. It’s likely you will have known people in your life that are on either side of the spectrum. Ultimately, every endeavour starts with mindset which is why it is crucial to understand and apply to your life. That said, there isn’t a great deal of practical material available on the topic of mindset and certainly none that bring all of the important parts together. The few books that are written on the topic are generally authored by academics who cover the theory but not the practical parts which are, of course, the most important to understand. If you haven’t heard of Mike Cernovich you soon will. He describes himself as an author, lawyer, free speech activist and I would also add contrarian to that list. Cernovich is known for his blog, Twitter and Periscope musings, his political activism and the rise of Donald Trump (he predicted Trump’s rise long before it happened), his range of supplements and of course Gorilla Mindset. He’s a polarising figure who has covered all sorts of topics from law, politics, philosophy, fitness, the media and mindset. He’s not a trained psychologist but someone who has learned mindset strategies, applied them to his life and then condensed them into this book. Humans are broken. All of us. We are all broke in our own unique way. Some more than others but nevertheless broke we are. Even the richest entrepreneurs and successful sports stars have flaws somewhere in their character. Look at Tiger Woods. Look at the countless celebrities who found fame and fortune but failed to develop the mindset to cope with all they bring. If we focus on one part of life and are good at it we use it to form our identity and mask the unsavoury parts of our character. In other words, understanding of mindset can apply to everyone regardless of career success and social standing. The first chapter covers self-talk and the conversations we have with ourselves when we’re down. If you’re going through a tough period in life, be it a relationship failure, family issue or something work related, we often talk to ourselves negatively. Cernovich covers how self-talk is a powerful tool that literally can change your life if you can master it. Shifting negative self-talk to positive is all about recognising it’s happening and changing the conversation. Identifying the negative self-talk, recording it (talking to yourself in the mirror or recording your thoughts), questioning why it’s happening and then developing powerful affirmations will help you develop positive self-talk. “It’s all about your frame of mind”. You’ve probably heard this mentioned on TV and elsewhere but what does it actually mean? Framing is a means to position whatever situation you are in. Going back to self-talk it means the way in which you describe and position a situation to yourself. When framing you can choose to a situation where something bad has happened to you as a negative thing (“this is the worst thing that could happen to me. How will I move forward?”) to something more positive (“this is a challenge that is going to help me grow to become a more resourceful and complex individual”). The chapter includes a worksheet which allows you to identify your biggest problems and reframe them (for starters reframe ‘problems’ to ‘challenges’). Practising mindfulness has numerous benefits with scientific evidence to back them up. Problem is, most of the mindfulness industry have us believing that we should be sitting semi-naked in a cave chanting to be truly mindful. This is of course isn’t true and Cernovich makes the point that mindfulness can be performed anywhere doing anything. Mindfulness is being in the moment or as Cernovich says it’s ‘being rather than doing’. It’s about taking an active approach to life and being engaged not switching off. This chapter covers how to practice mindfulness while participating in the activities you want to be involved in and how to use mindfulness to achieve your goals. State basically means your mood and how you feel in the present moment. Controlling state involves using techniques from the previous three chapters: controlling self-talk, framing painful experiences as a period of growth and being mindfulness to check in with your current mood. This chapter discusses using NLP exercises to change your state using a series and includes a worksheet to fill out and work through. In the digital world where demands on both our time and consciousness are never ending it’s becoming increasingly hard to focus on one particular task. What is focus? Focus is a lens and that lens is your attention which you can use to zoom in on something intensely. When we lose focus the chapter outlines how to regain it through bringing in the previous chapters’ learnings and how to change focus from one activity to another (there is no such thing as multitasking). The following chapters move away from mindset techniques and into more lifestyle-related topics. This chapter focusses on using mindset to create the right lifestyle. This chapter alone could warrant an entire book given its broad subject matter. Lifestyle, Cernovich says, is the sum total of how you spend your time and in this chapter he discusses establishing a routine, cutting negative people out of your life and saying no to requests. The chapter concludes with an interview with a prominent psychologist on will power. If you read his blog you’ll know Cernovich is big into fitness and doesn’t shy away from discussing the benefits of TRT and PEDs. In this chapter he gives an overview of maintaining good health to improve mindset, from circulation, endothelial function, supplementation, breath, posture and so on. He cuts away from mindset related health and discusses more health and fitness more broadly. Again, a wide-ranging topic that could warrant its own individual book. Maybe he has one planned in the pipeline. This is a short chapter on developing good posture. Anyone that has watched Amy Cuddy’s TED talk (which Cernovich references) will know that good posture can help you in numerous ways from health to how people perceive you. Cernovich demonstrates what he calls the Abundance Posture Pose designed to open up the body. Cernovich discusses our relationship with money and makes the point that to live a good life we need money. Not in the frivolous materialistic kind of way but to live afruitful life and do good in the world. Status is slavery and Cernovich warns against buying items to impress other people. He says we should question why we buy the things we do. Since listening to his podcast on how status is slaveryit’s something I’m personally wrestling with in my own mind. This chapter also covers the abundance mindset and why you should see money everywhere. “Think like a producer rather than a consumer” Cernovich tells us. He also gives investment advice and on how to invest in the most important thing of all: yourself. This chapter is all about the power of visualisation where Cernovich gives the theory of it followed by some practical exercises to help readers positively visualise. The final chapter perhaps should have been rolled into chapter 10 as it’s very small. That said, it leaves a good ending to the book where Cernovich outlines his visualisation of his perfect day (writing, responding to readers, working out, eating healthy and going to sleep with the one he loves). It’s something that few of us will likely think a great deal about but really we should. The chapter asks the reader to visualise their perfect day and provides a worksheet to do so. I had already read Gorilla Mindset before I wrote this review so to get each chapter fresh in my mind I read it again. What struck me while reading it for the second time is that, for anyone new to the topic of mindset, it’s a book that likely requires reading three or four times due to the wealth of information and the practical nature of the chapters. It’s a book full of practical information and requires the reader to do more than just read to reap the benefits of it.. As in, examine their self talk and how they perceive challenges, develop mindfulness skills, practice focus, review their lifestyle, relationship to money and so on. It’s a full life overhaul. As Cernovich often says, you have to take action in life, and the methods given in Gorilla Mindset are no different. If a reader follows each chapter’s direction then there is a lot of action to take hence the book requires ongoing referencing. Gorilla Mindset is only for people who are looking to make change (or take action) which is not everybody. If you read Cernovich’s blog you’ll know he doesn’t cater to the masses nor does he try to. If you can change your mindset you can change any aspect of your life. For those who are looking to make fundamental changes to how they think, react and perform there is no other book better than Gorilla Mindset.